What Is Earwax, and Does It Have a Purpose? What Does Earwax Buildup and Blockage Look Like (Picture)? What Natural or Home Remedies Help Remove Earwax? What Is the Medical Treatment for Removing Earwax Blockage? Which Specialties of Doctors Treat Earwax Blockage? How Can Earwax Buildup and Blockage be Prevented? What Is the Outlook for a Person With Chronic Earwax Buildup and Blockage? Earwax (cerumen) is produced by glands in the outer ear canal to trap small particles and prevent them from reaching and damaging the eardrum. A blockage of earwax (impaction) occurs when the wax gets pushed deep within the ear canal or fills the width of the canal. The most common cause of earwax blockage is using Q-tips in the ear canal (and other objects such as bobby pins and rolled napkin corners), which pushes the wax deeper into the ear canal. Hearing aid and earplug users are also more prone to earwax blockage. An earwax blockage (or eardrum perforation) can be diagnosed by the patient's symptoms and looking into the ear with an otoscope. Home remedies to remove excess earwax buildup at home include over-the-counter (OTC) softening ear drops, or a bulb type syringe to gently flush the ear with warm water. Ear candles are not recommended for removing earwax. Medical treatment for earwax buildup and blockage removal may include instruments to remove the earwax or by irrigating the ear with warm water or prescription eardrops (cerumenolytic agents). Excess earwax buildup, blockage, or impaction may be prevented by avoiding use of cotton-tipped swabs and other objects that can push earwax deeper into the ear canal. The prognosis for excess earwax buildup or blockage is generally good, though complications can include perforated eardrum, middle-ear infection, swimmer's ear (external-ear infection), and permanent hearing loss from acoustic trauma. 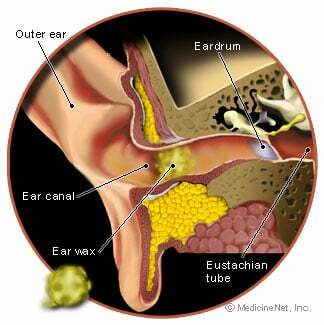 Earwax (also spelled ear wax), medically referred to as cerumen, is produced by glands in the outer ear canal. Its purpose is to trap dust and other small particles and prevent them from reaching and potentially damaging the eardrum. Earwax also may prevent the growth of bacteria and fungi in the ear canal. Blockage, or impaction of earwax occurs when the wax gets pushed deep within the ear canal or fills the width of the canal. Earwax buildup and blockage affects about 6% of people and is the most common ear problem doctors see. The most common cause earwax buildup and blockage is the use of Q-tips in the ear canal (and other objects such as bobby pins and rolled napkin corners), which pushes the wax deeper into the ear canal. A doctor can diagnose earwax buildup or blockage (or eardrum perforation) by listening to the patient's symptoms and then looking into the ear with an otoscope (ear-scope). In most cases, earwax should not be removed. It only needs removal when a person experience earwax symptoms of earwax buildup or blockage. Earwax buildup or blockage treatment and removal may be accomplished at home with over-the-counter softening ear drops, or a bulb type syringe to gently flush the ear with warm water. Medical treatment for excess earwax buildup or blockage removal may include instruments to remove the earwax or by irrigating the ear with warm water or prescription eardrops (cerumenolytic agents). Medical removal is recommended if the wax is obstructing the view of the ear drum, or if symptoms are present including decreased hearing or the presence of pain. The person may try a few excess earwax buildup removal methods at home unless they have a perforation (hole) or tubes in the eardrum. Over-the-counter wax softening drops or kits, for example, carbamide peroxide (Debrox, Auro, Murine, Kyrosol) or warmed mineral oil may be put into the affected ear and then allowed to drain out after about five minutes for earwax removal. A bulb-type syringe may be used to gently flush the ear with warm water. Ear-Clear is a warm-water irrigation device that is available online. It is very important not to use forced water, for example, a Water Pik, because this may cause damage to the eardrum. Ear candling is not recommended for removing earwax. Ear candles are hollow cones made of paraffin and beeswax with cloth on the tapered end. The tapered end is placed inside the ear, and an assistant lights the other end, while making sure your hair does not catch on fire. In theory, as the flame burns, a vacuum is created, which draws the wax out of the ear. Limited clinical trials, however, showed that no vacuum was created, and no wax was removed. Furthermore, this practice may result in serious injury. The doctor may remove the earwax buildup with a small plastic spoon called a curette, or by irrigating the ear with warmed water, saline, dilute peroxide solution, docusate (Colace), sodium bicarbonate, or other prescription-strength eardrops. If ear wax does not block the view of the ear drum and is asymptomatic, in many cases, it does not require removal. Earwax buildup or blockage can be diagnosed and treated by your primary care provider (PCP), such as a family practitioner, an internist, or child's pediatrician. You may also see an emergency medicine specialist in a hospital's emergency department. In severe cases you may be referred to an otolaryngologist, also called an ear-nose-throat specialist (ENT) for treatment. Earwax blockage can be prevented by avoiding the use of cotton-tipped swabs or Q-tips and other objects that push the earwax deeper into the ear canal. A study has also suggested that earwax buildup may be prevented by application of a topical emollient. Individuals with hearing aids should be routinely examined for earwax impaction (cerumen impaction) every 3 to 6 months. Chai TJ, Chai TC. Bacteriicidal activity of cerumen. Antimicrobial Agents and Chemotherapy. 1980; 18(4):638-41. Dinces, E.A., MD. "Cerumen." UpToDate. Updated: Jul 30, 2015. Ernst E. Ear candles: a triumph of ignorance over science. J Laryngol. Jan 2004; 118(1):1-2. Saloranta K, Westermarck T. Prevention of cerumen impaction by treatment of outer ear canal skin. A pilot randomized controlled study. Clin Otolaryngol. Apr 2005; 30(2):112-4. Stone M, Fulghum RS. Bactericidal activity of wet cerumen. The Annals of Otology, Rhinology and Laryngology. Mar 1984; 93:183-6. WhatleyVN, Dodds CL, Paul RI. Randomized clinical trial of docusate, triethanolamine polypeptide, and irrigation in cerumen removal in children. Arch Pediatr Adolesc Med. Dec 2003; 157(12):1181-3. What treatments have effectively removed your earwax buildup or blockage? Please share your experience with earwax buildup or blockage. If known, what was the cause of your excess earwax buildup or blockage? What symptoms have you experienced with earwax buildup or blockage?